BERLIN – German Chancellor Angela Merkel has never been regarded as an especially inspiring orator. In fact, she has a reputation for gently talking her audiences to sleep. But that all changed a few days ago. While campaigning in the Munich suburb of Trudering, Merkel, speaking from a beer tent, delivered a powerful speech that dominated headlines on both sides of the Atlantic. With Whitsunday fast approaching, many wondered if Merkel had been inspired by the Holy Spirit. If not that, she may have been spurred to action after having spent many hours in the company of US President Donald Trump during the recent NATO and G7 summits. And Germany’s upcoming federal election undoubtedly loomed large in her mind. But Merkel’s speech was no mere “beer tent Goslar.” She was not emulating former Chancellor Gerhard Schröder, who, campaigning in the town of Goslar in January 2003, declared that Germany would not participate in the Iraq War, regardless of whether it had the United Nations Security Council’s backing. There was far more to Merkel’s Trudering speech than mere electioneering. “The times when we could completely rely on others are, to an extent, over,” Merkel said, “and therefore I can only say that we Europeans must really take our fate into our own hands.” Some might take this to mean that Germany is turning away from the transatlantic alliance, pursuing a strategic realignment, or entering a new era of insecurity. But Merkel’s statement meant nothing of the sort. Anyone who has been paying attention has known for some time that the historic changes taking place today did not originate in Germany. Rather, they are emanating from the geopolitical West’s two founding members: the United States and the United Kingdom. Prior to Trump’s election and the UK’s Brexit referendum, Germans saw no reason to make fundamental changes to the existing geopolitical order. But those two events have shaken the foundation upon which Europe’s peace and prosperity have rested since World War II. Britain’s decision to withdraw from the European Union could inspire other countries to follow suit. And Trump’s isolationist, “America first” agenda implies that the US will abdicate its leadership role in the world, and possibly abandon its security guarantee for Europe. Europeans avoided a disaster of historic proportions in last month’s French presidential election. If Marine Le Pen of the far-right National Front had been elected, she would likely have brought an end to the euro, the EU, and the common market. Continental Europe would now be mired in a deep economic and political crisis. Those who still support a unified Europe need to take a lesson from the near-miss in France, lest history repeat itself. Europe must expand its capacity to act, and to respond to crises and changing circumstances. That was the message at the heart of Merkel’s remarks. At the same time, Merkel was addressing ongoing debates among pundits and press commentators about what Brexit and Trump’s presidency might mean for the future of transatlantic and European cooperation. When Merkel observed that “we Europeans must really take our fate into our own hands,” she was stating a plain fact. Still, only those who have hopelessly underestimated Merkel could think that she would turn away from transatlanticism. Merkel knows that the US is indispensable to Europe’s security. But she also knows that Trump’s presidency has cast doubt on both the American security guarantee and the shared values that, until now, firmly linked the two sides. A careful analysis of Merkel’s words shows that she was not questioning the future of the transatlantic alliance. Rather, she was calling for a stronger Europe. Merkel knows that if the US sacrifices its place at the top of the international order for domestic political reasons, it will not be replaced by a new leading power, nor will a new world order emerge. What we will have is a power vacuum, marked by chaos. And as the world becomes less stable, we Europeans will have no choice but to come together to defend our interests. No one else will do it for us. So, Merkel’s speech was first and foremost about strengthening Europe. And, fortunately, she has found a partner in French President Emmanuel Macron. Both leaders want to stabilize the eurozone, restore economic growth, and strengthen Europe’s security with a joint border force and a new refugee policy. Merkel surely meant what she said in Trudering. Given the tumultuous international environment and the EU’s own recent close call, there is no alternative but to take action, and her remarks could have far-reaching consequences for Germany’s place in the EU, and for its relationship with France. 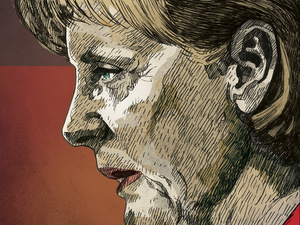 Germany’s current role as the eurozone’s penny-pinching know-it-all is at odds with the new approach that it must take. To demonstrate real leadership within the French-German partnership, Germany will have to make political concessions. Moreover, just because Trump says something does not automatically mean that it is wrong. Germany, and Europe generally, will have to do far more to ensure its own security, and to reinforce the transatlantic bridge that sustains European peace and prosperity. And as we pursue that project, we must stick firmly to the liberal values that make us the envy of aspiring democrats, and the bête noire of authoritarians, around the world. Joschka Fischer, Germany’s foreign minister and vice chancellor from 1998 to 2005, was a leader of the German Green Party for almost 20 years.